Only a short coach trip away from the Adriatic beach resorts, Gradara vies with San Marino as one of the most popular day-tripper destinations for the riviera package tourists. 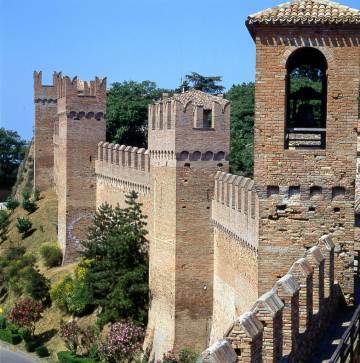 The imposing 14thC walls which enclose the town (some of the best preserved in the region), with their crenellated battlements and bristling towers, are one of the most striking landmarks to be seen from the northern Marche coastal strip. From the main car park, the single main street heads gently up through the city gates to the fortress at the higher end of the town, passing every type of tourist shop, stocked with souvenirs to suit every age and every wallet, if not necessarily every taste. The fortress which dominates the town was owned by the Malatesta family. It was here, according to tradition, that the murder of Francesca da Rimini and her lover Paolo, the lovers immortalised by Dante, took place in 1289. The Malatesta family managed to keep hold of Gradara for almost two more centuries, successfully defending it for forty two days against a siege waged by the rival Sforza family (led by Duke Federico of Montefeltro, the Duke of Urbino) before losing it to them in 1464. Most of the decoration of the castle was carried out in 1493 by Giovanni Sforza for his young bride, the notorious Lucrezia Borgia, daughter of Pope Alexander VI and sister of the infamous Cesare. The chapel boasts a magnificent glazed terracotta altarpiece by Andrea della Robbia, though most of the crowds seem more interested in the armoury and torture chambers. Francesca was the daughter of Giovanni da Polenta, lord of Ravenna. Gianciotto, a courageous but exceedingly ugly soldier, obtained her father's consent to marry her. Fearing that she would be repelled by his ugliness he persuaded his handsome brother Paolo to court her on his behalf, posing as Gianciotto. Once the marriage contract was signed, the real Giancotto (the ugly one) slipped into the marriage bed, to the understandable horror of the young bride. But, more tragic still, Paolo and Francesca had fallen in love with each other. When Gianciotto discovered that his brother had betrayed him, he murdered them both. Dante immortalised the story in the fifth canto of The Inferno.